Of course, we are still talking about “Safety First” in yet another posting. When I type the words (a monkey is stolen) it makes me have a sinking feeling in my heart. This is a subject that I do not like to talk about but it is yet another part of the “Safety First” topic that needs to be covered thoroughly. So let’s begin. 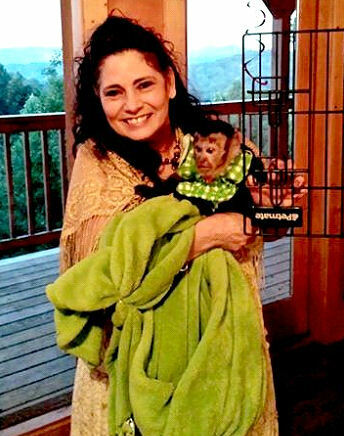 Recently, in the monkey circles on Facebook there was a family that had someone break into their home while everyone was gone, and take their young baby monkey. This actually was what prompted me to begin my first posting about becoming a “Safety First” type of monkey caregiver, here on the Primate Care site. It is important to us monkey caregivers to have well thought out plans formed in our minds if something devastating takes place with our monkeys. I am so happy to report that the outcome was wonderful for this little monkey and it’s family. They used good judgment and choose to instantly kick into action upon finding the monkey was missing from it’s cage. They did many of the same things that will be listed here on our list. This story touched my heart and soul. I can’t imagine what it would feel like to know that my precious monkey had been taken and not know where he was. I prayed for the family that this happened to as did many others. The prayers were evidently heard and he was returned early the next day. A monkey becomes such a part of our families that many begin to treat them as they would a child and never leave them unattended. However, others choose to leave them for several hours from time to time by themselves. We all must choose how we wish to deal with the issue of caring for our monks. I would like to add some positive suggestions about choosing to leave your monkey unattended. It is always great to have neighbors that are friends and eager to help you watch your home when you leave your monkey at home alone. Choosing to live close to neighbors and not alone in the country is a positive thing to think about doing, when you are the caregiver of a monkey. It is always a good idea to not speak of the cost of your monkey to other people. It is a good idea to play down having a monkey as a pet and to not put them into the public’s eye unnecessarily. Monkeys naturally draw so much attention and we are all so much in love with them that we naturally love to share them and talk about them with other people. However, when we choose to do this we are passing on information to people who then pass it onto others. Before we know it there are a large number of people who know private information about our lives and our monkeys. People that are calling on you to do service in your home or people who just randomly stop by your home, do not need to know that you have a monkey. 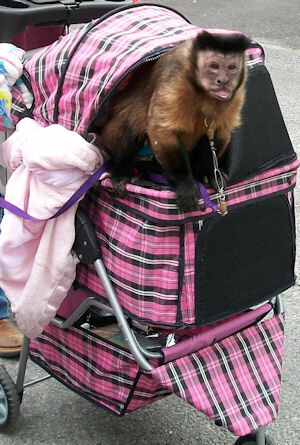 You do not need to take your monkey out in public and draw attention to it. If you do, choose to use a very discreet type of traveling device that cuts down on the visibility of them. 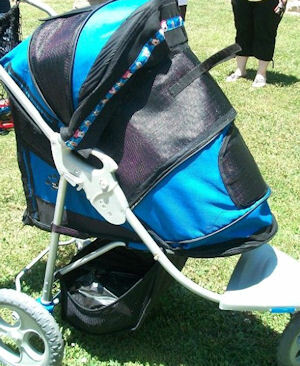 I use a real baby carriage with a small cage and then cover the hood and cage up with a light weight cover. Most of the time people never know that I have a monkey with me. The next three photos are pet carriages that I have taken and put extra protective covering over the windows which cuts down on visibility, but does not cut down on air circulation. The monkeys can see out but people cannot see in. 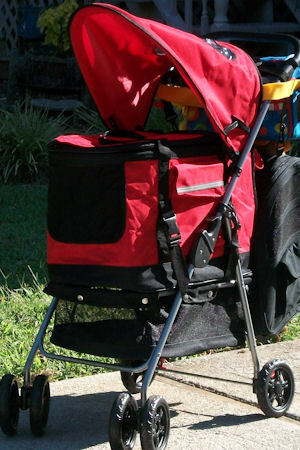 This Animal Carriage is a lighter duty type of stroller. This Animal Carriage has a removable animal carrier. This is your safest type of carriage (except for the children’s carriage with a cage placed in the seat of it). The reason it is considered the safest type of animal carrier is because your monkey can be safely put into the carrier inside your vehicle, and then be moved to the cart of the carrier which is outside the vehicle. Using a carrier that safely protects your monkey during transfers (from outside to inside) is being a “Safety First” monkey caregiver. When I choose to take my monkeys out, I wish to have fun and not spend time a huge amount of time answering questions. I feel the fewer people who know that I have a monkey with me, I am not only protecting them better but I am insuring that our time will be full of more fun. My monkeys love to go out and see new things and experience life also from their strollers. There are so many new type of surveillance equipment and home security systems available for our homes now days. Take time to get familiar with what are some of the newest types available and think seriously about installing something that fits your individual needs. Peace of mind is an important thing when you are the caregiver of a monkey. They are such a huge part of our family, our world, our life. We wish to always have them safely protected. The last positive suggestion I would like to add is: Please remember to wrap your love and positive energy around your monkeys every time you must leave them. Worry and fear are in the basement part of human emotions. Start remembering to stop at the end of your driveway every time you pull out and put a protective circle of love and God’s light around your world. Ask for safe travels and remove any negativity from your heart and mind. Find peace within your “Safety First” monkey care-giving. Things to do in case your monkey is stolen. Put your mind into positive direction by beginning to network. Get weather-proof signs together to put out on telephone poles and in other places. These signs should be large enough so they can be seen from the road. The amount of the reward should be set no more than $500. The reason for doing this is that people will run you from one place to another when there is a huge amount of money offered. (You do not need to wast your time during this process). If you feel raising the amount of reward is important, you can choose to do this at a later time. Always add the monkey’s information to the flyers and to the signs. Please also remember to put a phone number of all handout materials and flyers. Call the local radio stations, TV stations, police and tell them the amount of your reward and what the monkey looks like. Make sure that any articles about this have your contact phone number in the article. Talk to everyone you run across (that is willing and available to talk with you) about the theft of your monkey. The small handouts and signs can be 1/4 of a page so you can get four to a page. The pole weatherproofed ones need to be larger. Try to get the best possible print on all of your signs, and handouts. You will need good size heads on your nails for the poles, hammers, large push tacks or push pins, strong clear tape for windows in stores, and tape where you cannot hammer your outdoor lamented pole signs (maybe duct take.) Remember to call in favors from your friends and relatives during this period of time to help. The words “Monkey Stolen” “Reward” needs to be very large for the page size flyers so that they can be tacked up everywhere you go in your area. The 81/2 by 11 flyers go inside of the windows of grocery stores and other place where people visit often. Getting the message out to people in your area is so very important when a monkey has been stolen from your home. Responding quickly is very important and absolutely necessary in order to make your chances of getting your monkey back a reality for you and your family. Of course, this is old style networking that we are choosing to use to get the message out, but believe it or not it still works great. Facebook and other new type of networking is important also but getting the word out fast in your area is very important in being able to get a stolen monkey returned to it’s family. This has been the first time that I have ever spoken about monkeys getting stolen. I never wish to put out into the world that it is a possibility to have this happen to anyone, but I do have a story I would like to share about this type of thing happening.. Early in my years with the monkeys, I was very close to someone that lost a monkey to theft. This was a heartbreaking experience for me and my friend. Kermit was the old time organ grinder who taught me many things about monkeys in the beginning of my life with living with them. This experience of helping him locate his monkey went for almost 2 years before we were able to put an ending to it. Little Patty Cakes was a very special little girl monkey. She was almost 5 years old when she was taken from her home. Kermit was very sick and weak during the last part of his life. He lived out in the country close to his son’s place in Central Florida. I had spent hours and hours with him eagerly telling me his “Monkey Man” stories. He had been a monkey caregiver for over 35 years. One of the stories that he told me about was a couple (Rick and Judy) that had lived with him a few years earlier and had helped him when he had first become ill. He told me that they had a terrible falling out and that they would never live with him ever again. I could tell that he was very upset every time he spoke of this couple but I did not spend very much time thinking about this. (I did ask his son Fred about the couple and he said he agreed that they did not need to come around ever again, that it was much to hard on his dad (Kermit.) Rick and Judy had been gone from their area about 8 months when I met Kermit and his son Fred. When I would visit Kermit he always wanted me to spend time with his little Patty Cakes. He felt that Rick’s male energy had been much to strong for her, and he thought she might turn out to be a woman’s monkey. She loved to stand up tall and make herself larger than she was. The other thing that she did so eagerly was to clap her hands. That little monkey was so cute and she did learn to enjoy the time that we spent together. When it was time for me to take my retail business out to do the special events for the season, Kermit asked me to take her with me. He was so eager to see her relax and enjoy life. He told me as I was getting ready to say goodbye to him that he was so glad that the couple was not there and that maybe Patty Cakes would have a chance to get over the harshness the man had used with her. After hearing these words I was so glad that I was taking her with me for the season. When I took little Patty Cakes from my camper and inside his house, she became very upset when Rick came towards her. I was very steady with my hand and held the lead extra tight and then asked Kermit where he would like for me to put her. He then told me to just leave her in the living room in her travel cage near where he was setting. Of course, I was not sure what to think about this new turn of events but since his son was okay with it I choose to be okay with it also. We had a nice visit, and Kermit really enjoyed seeing my monkeys again. I remember he cooked them a skillet of his famous corn bread and enjoyed feeding each of them a large piece. My heart sank and I spoke the next words, “No, Kermit, I do not have Patty. What has happened?” I instantly started crying while trying to listen to what he had to say through my sobs. Soon the next day the USDA and Florida Fish and Game had been called about Patty Cakes being stolen. The day that it had happened a investigator had come out to inspect the site where the theft had taken place and make a report. When I asked Kermit about Rick and Judy’s whereabouts he told me that he had said goodbye to them three weeks earlier and that they had returned to Arkansas. The big breakthrough in the case happened when Kermit’s son happened to find out that his wife had left him and that she and he had split up for good. This information had come through a relative of her family. I did not know that the investigator had sent out a report to Arkansas to be on the look out for this couple who might be harboring a stolen monkey. Several months passed by with not one lead on Patty Cakes whereabouts. Then Kermit called me up to tell me that a report had come in from Arkansas that Rick had been picked up for stealing a pack of cigarettes in Little Rock but that they had not checked him out and had just let him go. When he did not show up for his court date they found out that he had a warrant out for him, regarding the possible theft of Patty Cakes. The police department in Little Rock assured us that they would keep an eye out for him. They were sure that he would screw up again and the next time they would not let him go. Months and months passed by and there was never any more word from Little Rock or Judy’s family. I knew it was time to do something. Kermit had lost his favorite older monkey Ginger and he was fading quickly. His son, Fred was very worried about his Dad’s emotional and physical condition also since Ginger had passed away. This is when I decided I was going to Little Rock, Arkansas and turn over some stones and just see what I could find out from the police department there on my own. 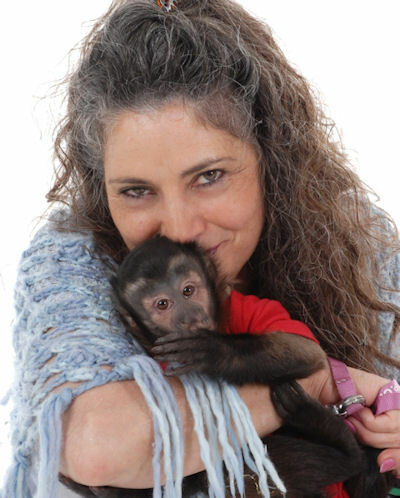 Kermit had given me the opportunity to spend my life in the world of loving and caring for monkeys. He had taught me so many things that I would carry with me the rest of my life. He had opened up his heart and had received me with loving arms and I knew he was not long for this world. He was depressed and totally broken hearted after the death of his long time partner and best friend, Ginger (on top of loosing Patty Cakes). So, I decided to book an event in Little Rock. I had a plan and I was going to do everything possible to have the courage to confront the police department and ask to see the records and information that they had gained about the couple. I learned that his wife, Judy was working close by my location and that they even had a phone number for her at the place where she was working. It was hard to call Judy’s number and hear her voice on the other end of the line. I quickly introduced myself and then told her that I was in town working and that I would like to see her again. She invited me to come to the bowling alley where she worked after my event closed for the evening. I regained my composure as quickly as I could since this was my first proof that Rick was the one who had taken our precious Patty Cakes. We both asked each other many questions and we each answered them as best that we could. She was mostly interested in how Kermit was after the loss of Patty Cakes and now Ginger too. Of course, Judy wanted to know if she was going to get in trouble for the theft. I learned from the conversation that she knew he was going to do it but that she did not go to get her with him. She really felt that he would not go through with it but when he came home with the monkey, they really started fighting badly which lead to them spiting up. More and more of the story started to unfold as she continued to speak. I tossed and turned all night and kept going over and over all of the information that I had gained from the police department investigator and Rick’s soon to be x-wife, Judy. Of course, the next day I found the courage to call Kermit from one of the pay phones close to where I was working. That was not an easy phone call to make but at least we now had information that we knew was true. Rick had traveled all the way down from Arkansas and back to Florida to steal Patty Cakes, during the night while Kermit slept. That night after my work, I was tired so I just decided to kick back on the couch in the camper and try to get into a space of relaxation. It had been hard to have to tell Kermit that Rick had left Little Rock, and that I knew without a doubt from talking with Judy that he had Patty Cakes. There was a knock on the door of the camper and I remember jumping a little because I knew of no one that would visit me at this time of night. The door was locked and I decided to not open it up but instead I went over to the door and asked who it was. The voice said,”Ms. Campbell, this is the detective from the Little Rock Police Department. We have some information for you.” I instantly opened up the door and in stepped two police officers. He said quickly, “The monkey burned up in a fire at a flea market in McAllen, Texas, which is close to the boarder of Mexico. I guess Rick was ready to jump the boarder………” I don’t remember what else he said because just about that time my legs went weak like rubber and I felt like I was going to pass out. The other police man came over to steady me and help me to the coach. My heart was broken into pieces all over again. I though that we were going to be able to get Patty Cakes back home. I thought that I would get to hold her again and love her. I thought that Kermit would be able to heal from this terrible thing, when his special Patty Cakes was returned. I had prayed for her to be home again over and over again. This ending had never entered my mind! This story did not end here though as I am sure you would think it would. Kermit was not doing well when I returned to Florida in January of that year. It seems to me he was angry all of the time I just didn’t understand exactly what was going on with him but I continued to visit him through the winter often. He loved seeing my monks grow and change. I remember that he was especially excited to get to see Becky who had been one of Joe Lopez’s monkeys years ago. Joe was the man that had died several years before I had met Kermit. 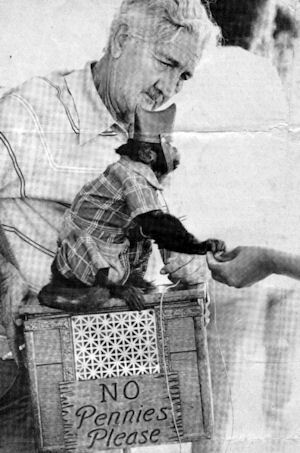 He had been the monkey man that had trained Kermit’s first monkey and had trained him to be an ole time organ grinder. Kermit would always compare all of the monks to his Patty Cakes. I could tell he missed his Ginger too, who had died just about 8 months previously. Soon it was time for me to leave Florida and go home to Tennessee for awhile before I started selling the t-shirts for the Indy 500. “Well, Kermit, you know I will do what you ask of me but I don’t feel right about this. I really feel as if you need to keep him with you.” He just shook his head and motioned me to take him. I quickly took Sam over to say goo-bye to Kermit and then walked him out to my camper. He happily said, “Well, I want you to bring back Sam. I am missing him.” I was so excited to hear this, and we talked as we had talked many times before with a lightness flowing back and forth between us. My daddy and I planned a trip down there to try out the motor home that he had helped me get from Minnesota. The trip would be her maiden trip to Florida. Within a few days we were all packed and on our way to take Sam back to Kermit. He was so excited to see us coming in the door. Sam was excited to be back home with his daddy again too. I was so wonderful to see Kermit more like his old self. It was a short trip but a good one. We chose once again to stop by and see Kermit on our way out of the state once again. Daddy and I looked at Kermit sitting on his front porch with Sam sitting on his knee as we waved good-bye after our short visit. Daddy looked over towards me and quickly said to me, “You will not ever see him again, Mary Lynn.” I knew what Daddy was saying was true. The look that Kermit and I shared in those few moments as we waved good-bye said volumes. It was the last time I every saw him. A month later I returned to Florida to go to Kermit s funeral. It had been a hard couple of years since Patty Cakes had been stolen on us all. Kermit had been very demanding about me being a safe money caregiver and at times he would go over again and again the issues of safety to get his points across to me. He had lost many monkey down through the years and he did not wish for me to encounter the same types of things that had happened to him and his monks. We learned through our time together that we really loved each other and without a doubt we both knew that we loved our monks. It was a very sad time in my life once again. I missed my friend, Kermit, the monkey man. After a few moment I made my simple response, “It is over.” In those short moments was when I forgave Rick. I thought about him coming back to the flea market that night and finding her little body burned up in the cage along with everything else he had in the world. He had loved her too and in his own way he had loved Kermit. He would never get the chance to tell Kermit how sorry he was for doing what he did. All three of us had loved and cared for the little hand clapping monkey. It was now time to let her go. Note: Now you know why hearing about a monkey getting stolen has the power to give me that sinking feeling in my heart. Do everything possible to keep your precious monkeys safe, happy, and in your possession. Many will say these types of things that I have been posting here on the Primate Care Site, will never happen to me. I am hoping and praying that they don’t but at least you now have some solid, proven and tried, plans to follow if you need them. Do not dwell on these “Safety First” posting. Take some time to read them and let the information sink into your mind. I suggest that you then move away from any fear or worry or even any anger that might be brought up of the thought of these types of things happening to your beloved monkey. It is so important to be informed about these types of safety issues. I promise if you will follow some of these ideas that you will gain peace of mind and become a better prepared monkey caregiver. I wish more than you would ever know to be truly helpful in passing the most important things for you to read and study about, in these postings. Thank you for visiting us here at Primate Care. We are committed to bringing good information for you to think about and share with your family, friends, and other monkey caregivers. In the next posting on the Primate Care site I will be speaking about the next type of event that could happen and that is when a monkey gets away from you and chooses to run.